Wasatch Resource Recovery is a facility operated under public-private partnership between ALPRO Energy & Water and the South Davis Sewer District. The WRR facility will produce nitrogen and phosphorus as a byproduct of anaerobic digestion. These nutrients will then be discharged to the South Davis wastewater treatment plant where the district has started a project that removes them from all of its wastewater. The project is currently in its pilot stages, operating in a single greenhouse. The technology, provided by ClearAs Water Recovery, uses algae to remove the nutrients. The full scale project will utilize 140 miles of 4-inch glass pipe installed in a 200 x 450 foot greenhouse. This process cleans wastewater to a level that satisfies Utah State regulations while recovering valuable nitrogen, phosphorus, and carbon. Carbon dioxide scrubbed from renewable natural gas produced by our digestesrs will be used to supply necessary carbon for the algae to grow. The digesters will also produce additional nitrogen and phosphorus that can be used to supplement the algae’s nutrient requirements if needed. 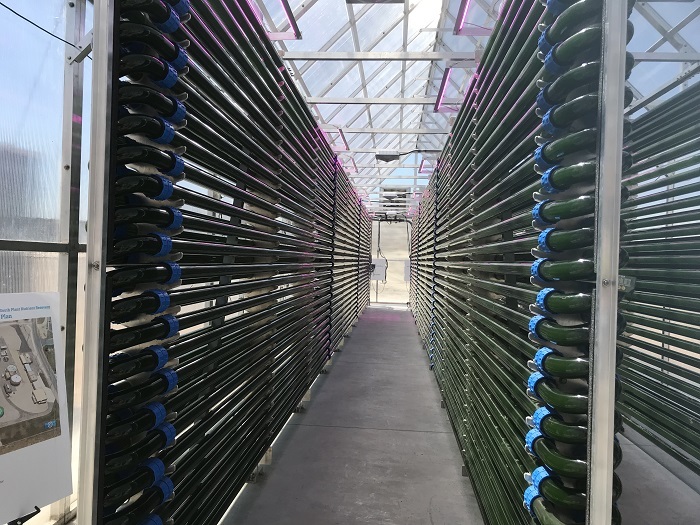 The project will produce 8,000 to 10,000 pounds of algae per day which will be harvested, dewatered, dried, and sold. The dried product can be marketed for a variety of uses including bioplastic production, cosmetics, fish feed, livestock feed, bio-diesel, and succinic acid, among others. A few weeks ago, the Utah Division of Water Quality Board toured the pilot facility and seemed pleased with the progress of the project. Effective and economical from both a regulatory and operational standpoint – the project has the potential to revolutionize the way nutrients are treated and water is recycled in Utah. Producing useful byproducts from waste is a major focus of both Wasatch Resource Recovery and South Davis Sewer District. Revenue derived from a resource that is otherwise seen as a pollutant is exciting and produces both economic and environmental benefits. This project will shed light on the immense potential our refuse harbors in solving problems related to limited resources, space in landfills, and excess waste.